What happens when two stamping friends get together???? Of course a stamping challenge! Sheryl and I got together for another creative day....Can you spot any projects on the desk? After hammering out some creative ideas, and working on a 1 and 2 place holder for the candy filled test tubes (I'll post those tomorrow), we decided a challenge was in order using Stampin' Up's Big Shot and dies to create a box. Here's the box I created, it uses the Scallop Circle (113469). It reminds me of the fancy nut containers you'll find at Christmastime. The lid of the box is stamped with the Snow Burst set in Riding Hood Red ink. The label on my box was created with the JustRite Small Letter Set, stamped in Riding Hood Red and Kiwi Kiss. 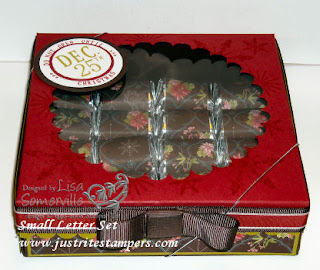 I used the Scallop Edge Punch to add a decorative border to the box lid, then added my 5/8" Chocolate Grosgrain, and Riding Hood Red Taffeta ribbon. My designer paper is Holiday Treasures, which I also used to wrap my nuggets that are in the inside of my box. Your finished box with candy and label looks awesome. 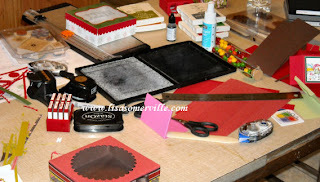 Looking forward to another stamping day with you! Oh wow that box looks so elegant and professional! very pretty! I have a little award on my blog for you, if you want it, Lisa. :) No biggie!!! Another FABOO project by Lisa!! Must head over to see what Sheryl made.